ProMin contains food nutrients (including MSM, Glucosamine and Chondroitin) that are used by the body to rebuild damaged tissue of the musculoskeletal system — bone, cartilage, joints, muscles, tendons and ligaments. Excellent for structure and function of joints, tendons, ligaments, bones, teeth, muscles & more! Bovine Bone Meal Hydroxyapatite; Proprietary Blend: Horsetail Herb,* Wheat Germ (untreated), Dandelion Leaf,* Bovine Tracheal Cartilage,† Broccoli Florets,* Sunflower Seed,* Yucca Root and Sugar Cane (whole, unrefined). Inactive Ingredients: Gelatin, Microcrystalline Cellulose and Silicon Dioxide. In addition to the unique properties, synergists and cofactors of this food, each serving provides the following nutrients contained within the above food-nutrient blend (not as isolates): Vitamin A, Vitamin B, Vitamin C, Vitamin D, Vitamin E, Essential Fatty Acids, Phosphorus, Silicon, Iron, Potassium, Calcium, Boron, Magnesium, Manganese, Selenium, Zinc, Copper, Antioxidants, Bioflavonoids, Enzymes, Chlorophyll, Trace Minerals, Sulfur-Bearing Amino Acids and more. 6 tablets or 3/4 tsp. of powder daily, or as directed by a healthcare practitioner. Due to the widespread and varied number of health problems associated with the musculoskeletal system, researchers have been looking for nutrient support for bone health, joint health, sports injuries (especially knees, elbows, shoulders, back, etc. ), inflammation, “growing pains” in the knees, and strains, sprains and other traumas. 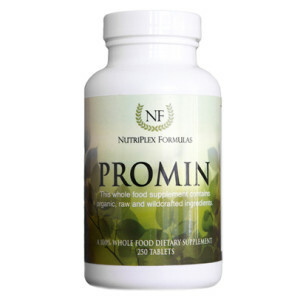 The foods in ProMin are intended not to treat diseases or symptoms, but rather to provide nutritional (as opposed to pharmacological) support in encouraging the body to heal and maintain itself with the basic building blocks of cells. Most information regarding bone and joint health focuses on the role of calcium. The mineral strength of bone depends on more than calcium. For calcium to actually strengthen bone, it must be consumed along with several other nutrients that few experts seem to talk about. Phosphorus is particularly important, but you also need magnesium, boron, zinc, vitamin D and vitamin A. Especially needed are the sulfur-bearing amino acids (contained in ProMin) that are used to create chondroitin and glucosamine sulfate, as well as others that form important proteins needed for connective tissue.